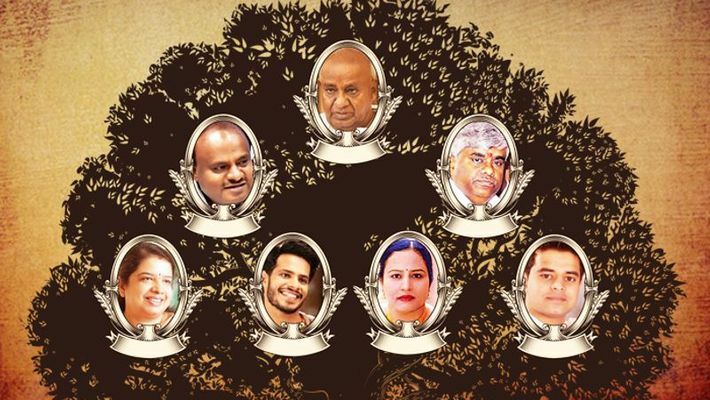 Bengaluru: With the JD(S) deciding to launch former Prime Minister HD Deve Gowda's grandson Nikhil Kumaraswamy into politics in Karnataka, it is clear that the JD(S) will never come out of its dynasty politics. The psephologists, public, and political opponents have used this move to hit out at the JD(S) and also expressed displeasure over democracy as it failed to lay any restriction on dynastic politics. Coming down heavily on the JD(S) for such a move, Sandeep Shastri, Jain University pro vice-chancellor says, Karnataka, in particular, suffers from 'son to grandson stroke'. "The JD(S) is by and large seen as the party of 'only family members'. This factor may not dent the Congress-JD(S) coalition as people have understood the promotion of only family members in to politics, however the public will watch for performances these days," said Shastri. Echoing similar sentiments, Muzaffar Assadi, head of the department, political science, Mysuru University, says it is the democracy set up that has provided scope for political parties to keep the dynastic tradition alive. "Democracy allows the parties to legitimise family politics. Like anti-defection law, it is the need of the hour for change in law and to contain dynastic politics," he opined. The saddest part is that these trends which by and large in the JD(S) are also seen in the Congress and BJP. Mallikarjun Kharge is a seven-time MP from Karnataka and now his son Priyank Kharge is a minister in HD Kumaraswamy's government. Former CM Siddaramaiah launched his son Dr Yathindra from Varuna in last year’s Assembly elections in Karnataka. Similarly, the state BJP president BS Yeddyurappa's elder son BY Raghavendra is a Lok Sabha MP from Shivamogga. Although leaders in the Congress and BJP have promoted family members into politics, it is the JD(S) that has become synonymous with 'family politics'. BJP leader and spokesperson S Prakash said that the saffron party never believed in dynasty politics and to send a strong message that it will not tolerate such a trend, the party high command denied ticket to Yeddyurappa's son BY Vijayendra from Hanur.